This is the first comprehensive scientific publication on these regions, indispensable for anyone with an interest in the subject. Almost 38,000 of the approximately 45,000 tropical islands on our planet with a minimum size of 5 hectares (7,000 being in the Atlantic Ocean) are systematically described and illustrated with typical examples. 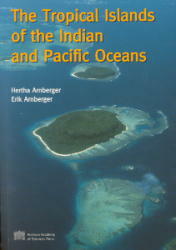 Apart from those islands which are of special geographical interest, this volume focuses on those where international tourism is a significant factor in the local economy, for example the Seychelles, Sri Lanka, Réunion or Hawaii, together with their specific regional problems such as rainforest destruction, rice cultivation, the impact of monocultures etc. Another aspect to be highlighted is the socio-economic diversity of these regions which ranges from the Stone Age societies in the interior of Madagascar, Borneo or Papua New Guinea to the high-tech lifestyles of the city-islands of Singapore and Hong Kong. This book is not only intended for reading; it is also a valuable reference work providing a wealth of often surprising information, maps, diagrams and photos, lists and indexes, completed with a new list, giving the location of more than 3,000 islands. The text is illustrated with numerous photos taken by the authors during their journeys in the tropics. Hertha Arnberger, junior lecturer at the Institute of Geography at Vienna University in 1942, collaborated with her late husband from 1938 on numerous research trips, books and other publications. She taught geography at a high school in Vienna for more than 20 years. In 1992 she was awarded the Golden Doctoral Diploma of the University of Vienna for her work on the tropical islands. Erik Arnberger (1917-1987), member of the Austrian Academy of Sciences, chairman of the Department of Geography at Vienna University 1968-1983, and director of the Institute of Cartography at the Austrian Academy of Sciences 1969-1985.